A look at Gainsborough Studios. I know about Thomas Gainsborough, but I know about him because of The Kinks. The portrait and landscape painter’s (1727-1788) most famous work is The Blue Boy, rendered in 1770 and thought to be a portrait of Jonathan Buttall, son of a merchant of Gainsborough’s acquaintance, at age 18. It was painted in response to a remark by a rival that the color blue is depressing and dark and shouldn’t be employed to a great degree in portraiture. It’s currently exhibited at the Huntington Library in the Los Angeles area. I was slowly making my way last summer down Central Park South, dodging tourists, selfie takers, and carriage horses, when my eye caught a very unique building partially swaddled in construction netting between 7th Avenue and Columbus Circle. It’s a mixed bag, with statuary and, I later learned, interesting entablature on the lower floors, and colorful terra cotta above. The building is called Gainsborough Studios, and there’s a bust of the painter above the front entrance, complete with a rendering of a pallette with paints and paintbrushes, and pigeon spikes on Tom’s shoulders, flanked by Corinthian columns and a shell motif in the rear. 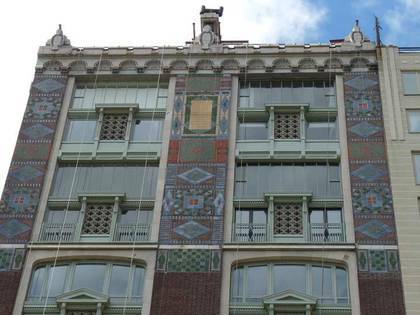 Intricate, colorful terra cotta friezes surround the upper floors. This photo doesn’t do the colors justice—see them later in the day when the sun is on them. 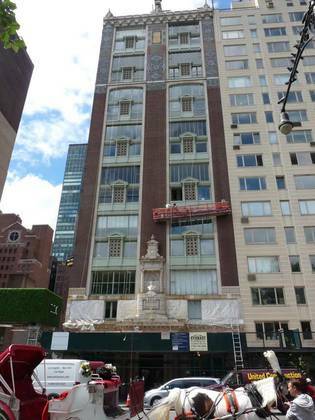 The Gainsborough Studios was built at #222 Central Park South in 1908 specifically for artists and painters to reside in, in reaction to a dearth of space in Manhattan, which was cramped and crowded even then. Apartments were designed so they could boast a large amount of northern light, and few spots filled that bill like Central Park South. A group of established artists named the Gainsborough Corporation funded the project and purchased a mansion at #222 which was demolished and the new studios built in its stead. Hidden behind the netting on the first floor is a frieze on both sides of the entrance by Isidore Konti showing a procession of people paying homage to an altar of the arts. The building attracted many well-known artists as residents in the early to mid 20th century, such as bandleader Artie Shaw. I’m not sure if Ray Davies knows about it.